With more than 7,000 islands in a tropical country, the Philippines is the perfect setting for the sand, sea and sun for its many beaches. The Philippines is pulling international visitors to its shores. Whether it’s the beaches with nightlife in the Philippines or beaches for surfing adventures, the best beaches in the Philippines are the earth’s paradise. The Philippines has become increasingly synonymous to Boracay, one of its beach islands. Some foreigners that do not know about the country’s capital, Manila, are aware of Boracay. The best beach in the south has become so popular with tourists (It has seen 1,725,483 visitors in 2016 alone) that the Philippine government enforced Boracay’s six-month shutdown for environmental reasons. The closure definitely rained on vacation plans. Before its closure, Boracay was known for being a party place. The Boracay night photos on Instagram are all stunning, vibrant and even reminders of the exotic nightlife you are missing out on. But the Philippines, pearl of the south as it is, has more beaches that offer the same setting without the crowds. We head south for the beaches with nightlife in the Philippines. Located southwest of Bohol and east of Cebu in the south-central part of the Philippines, Alona Beach in Panglao Island is often said to be Boracay’s quiet sister. While Boracay invites the thrill of happy hours and “What stays in, Boracay stays in Boracay” kind of secrets for young partygoers, Alona Beach is a destination for honeymooners and lovers. It is one of the beaches with nightlife in the Philippines. At Alona beach, it’s about cocktails and chilled beer by the sea or an acoustic band. The White Beach lives up to its name with the white sands welcoming crystal clear waters to the shores. Yet the nightlife certainly is colorful, with the fire dancing lighting up the night. If exotic is more of your vibe, the gay entertainment scene will tickle you with laughter with their jokes and slapstick. If that is not your kind of dark humor, the bars will invite you to drinks that pack a punch. White Beach in Puerto Galera is one of the vibrant and colorful beaches with nightlife in the Philippines. Just a bridge away from Cebu is Mactan Island. The nightlife is certainly for those with more cash to splash at one of the most vibrant beach clubs in the country. You have a VIP spot ocean view sitting under a sail-like canopies on the deck while you groove to the DJ spinning hip-hop and Latin music. With the impressive drinks on the menu, it is one of the most expensive beach clubs and in the Philippines. In Siargao, you are surfer by day, party animal by night. If there is another thing Siargao is famous for, it is surfing. 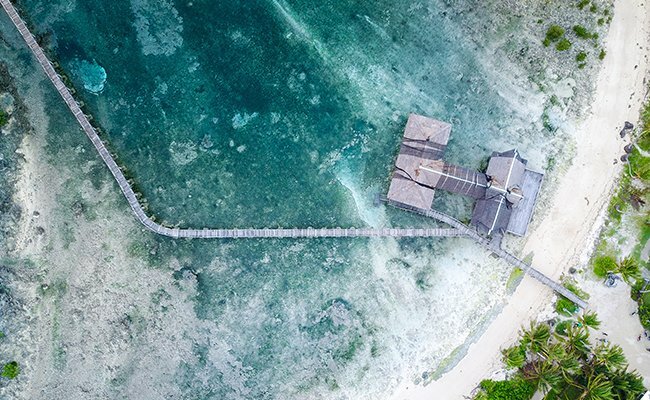 Siargao pulls you to its wild waves and palm trees, making it one of the best beaches in the Philippines for that much-needed island fix. If you’re not a surfer, this is a great place to get your feet wet and hop on a board.. If you’re an avid surfer and looking to ride the waves, Siargao is known exactly for that. If you are looking for a party experience, Siargao is one hell of a ride. Every Friday night, people come to a wooden shed with open walls, filling into the maximum capacity for the “Jungle” experience. You’ll have to pay a visit to the island to see it for yourself. Bravo, Rum Bar and Viento to name a few for the destinations for the much-needed party life. Of course, the best beaches in the Philippines are more known for their quiet charms and ode to nature. While there are no beaches that could rival the best beach in the south when it comes to nightlife, Boracay serves beautiful and pristine beaches in its own way. There is no competition for this one. Palawan has four UNESCO heritage site and one attraction on the list of the 7 Wonders, but it is also said to be the last frontier — with countless people saying it is the most beautiful place they have witnessed. With the rustic and historical charm to complement the powder white sands, blue-green oceans and dark green mountains filled with trees, Palawan deserves the glory it from any that set foot on it. It is so picturesque even French oceanographer, Jacques Cousteau, fell in love and called it the world’s most beautiful place. Palawan is definitely the best beach in the Philippines, and it could possibly be even on earth. Coron has shipwreck dive sites that take you to the WWII and the Japanese’s mark on the country. Not only is Coron one of the most beautiful and best beaches in the Philippines, but it is also a cultural and historical force onto itself. The beautiful El Nido is home to Palawan’s most lovely and visited attraction, the Bacuit Archipelago. If you see stunning photos of rock formations bordering blue-green water in Palawan, it’s in El Nido. Puerto Princesa is definitely one of the best beaches in the county and in the world. It resides one of the 7 Wonders of the World, the Underground River. Beyonce, Mariah Carey, Tom Cruise, and Brad Pitt have reportedly been on this island accessible only through a private plane. Yet we will never know for sure because the resort respects its guests’ privacy, which says a lot about the exclusivity of the island. Swim alongside fascinating white sharks underwater in Oslob, one of the best beaches in the Philippines. While there is much controversy floating around the beach’s shark activity, it is still an enthralling experience to be able to be so up close to a shark and to have a photo taken with one. A little up north but still considered a province of the south of Luzon, Batangas has a lot of beaches lined up because of being by the sea. 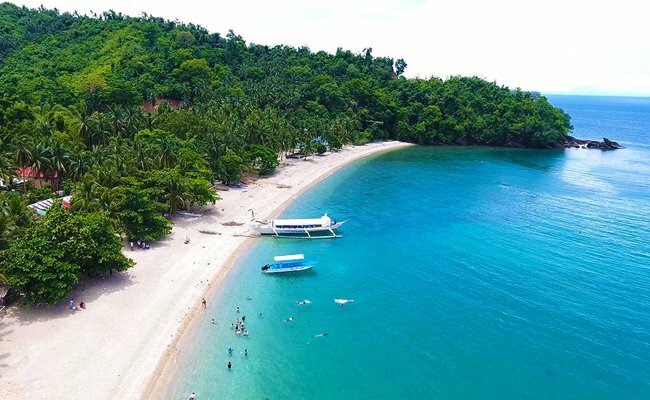 If you are coming from the capital Manila and are looking for a cheaper beach alternative close by, Batangas is the destination to be. It has a lot of beaches on the Luzon mainland, but there are islands that only take a few hours to go to via boat. With so many beaches in the province, Batangas’ shoreline is made up of various beaches — from sandy to pebbly to rocky, from secluded to fully developed, Batangas showcases the beauty of different kinds of beaches. Make sure to check out the beautiful Taal lake surrounded by a volcano when visiting the province. Now, if you really want to go farther, Samal Island in Davao is the best beach in the south. It is a quiet charm and little paradise unattached to most of the Mindanao region. There are so many things to do on the island aside from basking in the summer sun by the sea, such as scuba diving, hiking, biking, exploring farmland, showering under a waterfall, bat watching, and boating. The south is home to the best beaches in the Philippines, with Boracay, Palawan, Bohol one of the few places you know about the country. When heading for the Philippines, make sure to go to the best beaches in the south for the tropical country experience like never before.